Sir Ian Wood's £140m vision for Aberdeen's city centre gardens is approved by councillors. Sir Ian Wood’s £140million vision for Aberdeen’s Union Terrace Gardens has been approved by councillors. Aberdeen City councillors voted 20 to seven in favour of the proposals to accept the tycoon's £50m donation to build a new City Square, with 12 abstentions. The oil tycoon has offered to put forward £50million of his own money towards plans to raise the gardens to street level and turn it into a civic square. The venture was approved at a meeting of the full council on Wednesday despite the plans being rejected in a public consultation - with around 55% of participants voting against it. The emergence of Sir Ian’s vision jeopardised an earlier development by Peacock Visual Arts who wanted to build an arts centre in the gardens. The group has said it would face a "grim" future if its proposal to build an arts centre in the gardens was turned down. 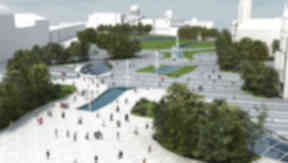 Peacock has already stated that it would be unable to secure its funding if it was to be incorporated into Sir Ian's City Square Project. A public row between supporters and opponents of both schemes has dominated headlines in the north-east for months. The project required 22 votes in order to be passed. Council chief executive urged councillors to accept Sir Ian’s money but the authority’s Labour group had declared it would vote ‘no’ on the scheme. Sir Ian Wood, speaking immediately after the decision, said: “Subject to being made aware of the full details of today’s council vote I am pleased that Aberdeen City Council has been visionary and far sighted in taking what must have been a very difficult decision on backing the proposal for transformational change in our city centre. “Many important issues have been raised and discussed during the course of the last 12 months. The polarisation on this very important issue has not been healthy for our city and, now that a positive decision has been taken, every effort must be made to take account of the various concerns expressed and ensure that the project proceeds in a way that will have the optimum impact and benefit for the citizens of Aberdeen." He added: “Today is not about winners or losers, certainly not in the context of the present parties involved. I believe if we make the right decisions over the next few months, all of the parties, including those who might feel they have lost today, will be winners and certainly the citizens of Aberdeen should be the long term winners.